Shortly after Overwatch 's latest hero, Baptiste, was announced, I started seeing Blizzard devs position the Haitian combat medic as a counter to GOATS, the game's unpopular defense-oriented meta. "Alright," I said to myself. "This seems promising." Overwatch 's current meta is heavily reliant on heroes like Reinhardt, Zarya, D.Va, Zenyatta, Lucio, and Brigitte. , with sprinkles of Sombra for when people are feeling tricksy. HP heavy duty mixed with crowd control is the order of the day, and Baptiste, a combat medic who can briefly render his teammates unkillable, does not detract from that. First things first: Baptiste is fun to play. His kit is complex but rewarding, with a straightforward burst-fire submachine, leading the charge while a plethora or defensive abilities bring up the rear. Initially, he has climbed up a bit, because he has two separate healing abilities — one that's entirely for his teammates, and one that's mostly for him. To heal his team, he can lean from his gun. These are similar to snake grandma Ana's branches, except that unlike her wound-knitting bombardments, these aren't heal Baptiste, nor they damage enemies. An order to heal himself, Baptist can deploy a regenerative burst that also heals nearby allies. It's a lot to juggle to the elegant simplicity of some other heroes, so I took a few matches before I set up an effective rhythm of burst firing at foes, grenading allies back to life, keeping myself away from death's through with my own healing and mobility, and saving the day with timely immortality fields. When I did, though, I regularly found myself exhilarated in a way I can say I have been with other support overwatch support heroes. I was starting to see ways in which Baptists could render the GOATS meta inert — at least, less. For example, at one point my allies and I were poised to take the point after a back-and-forth skirmish. Then the enemy team's Zarya fired off Graviton Surge's ultimate, clumping us all together in a helpless tangle. We knew what was coming next: The enemy D.We popped out of her mech, heralding a self-destruct meant to wipe out our whole team. Part of the person who should've been our Reinhardt was also playing Baptiste (the public test server right after a new hero has been announced is wild, all), we were basically doomed. But then I sent out my immortality field and a prayer. The mech exploded. We lived. This made me feel cool as hell, and the nullified and tried-and-true GOAT strat. 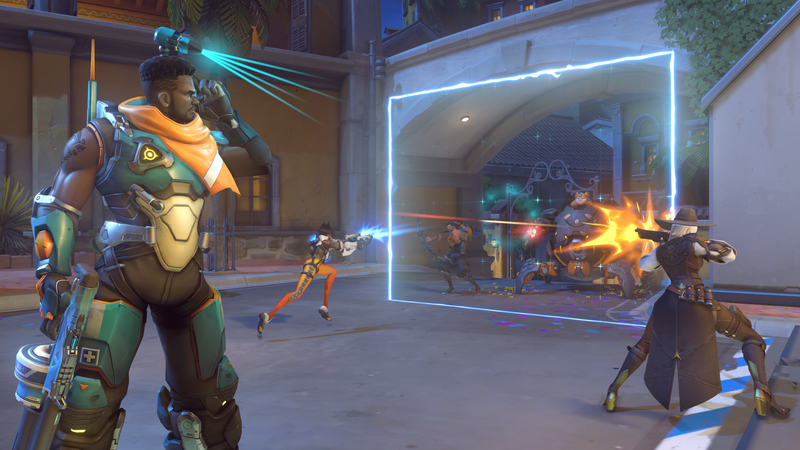 Similarly, Blizzard developers have suggested that players could use Baptiste's to help rangier DPS heroes like Soldier 76, Bastion, and McCree burst down shields and overcome GOATS steady stream of healing. On paper, it also seems to be synergized with non-GOATS, like similar mercy and Ana, given that its slightly-unreliable AOE healing compliments their sustained single-target healing. Heck, his immortality field even pairs with Symmetra, given that this shield wall can completely protect the immortality field's drone. In short, Baptiste gets a lot of heroes who've been on the sidelines for way too long. But at the same time, Baptiste's strengths play to many of GOATS 'strengths, and he doesn't really solve the issue at the core of this whole thing, even for people who just play GOATS without really employing the coordination necessary for the comp to sing. Fights have become less about big moments, and more about who can stay alive and in control the longest while frustrating the hell out of the other team. Baptist lets teams stay alive even longer meaning that it's likely Overwatch matches will continue to keep a similar pace, even if some of the particulars get switched around. Then again, I might be entirely off base. Baptiste is even in the live game, and top-ten players will doubtless pair him with every hero and imaginable to see what sticks. Plus, its release will be accompanied by a slew of promising balance changes. Maybe we're more out of the biggest DPS resurgence the game has ever seen. All I know for now is that Baptiste is fun to play. Here's hoping that we can get to know him a little better.